Feasts of the Year | In Domino Spera! Ps 8 R/. O Lord, our God, how majestic is your name in all the earth. When we examine Scripture and the history of salvation, one of the things that stands out very clearly is God’s desire for us to be in relationship with Him. From the Fall of Adam and Eve to the gathering of the people of Israel to the Death and Resurrection of Jesus until this very day, God is searching out for us, calling us to come to Him so that we might be in relationship with Him. But not just any kind of relationship. God doesn’t just want to be friends: He wants us to be in communion with Him, to be one with Him. This is the heart of the Gospel message we’ve been hearing for several weeks now, and which, in a sense, culminated in the celebration of Pentecost last Sunday. God want’s us to be one with Him; that’s why He sent His Son Jesus to teach us about Him and His love for us, and to show us how to respond to His invitation; and that why He sent us the Holy Spirit, to make that union possible and to deepen our knowledge and experience of His love and mercy. because God is not isolated or alone, but is in His very being a relationship of love. Last year I described to you the notion of the Trinity as a communion of love: the Father is the One who loves; Jesus, the Son, is the One who is loved and who loves in return; and the Holy Spirit is the One who is the mutual love. In celebrating this great mystery the Sunday after Pentecost, we also celebrate the reality that God wants us to be participants in that relationship of mutual love, in this communion of divine Persons. God created us not to be independent and solitary beings, but to be one with Him. That’s why He created us in His image and likeness: so that we, too, can love as He loves. In fact, loving is at the very core of what it means to be human. But our capacity to love isn’t to be focussed on ourselves, on being loved. To love means to reach out to the other for the sake of the other, to desire for the other what is good for the other. And this is what Jesus teaches us most perfectly by reaching out to us in our sinfulness and bringing us mercy so that we might truly live. As disciples this is key for us, because we’re called to imitate our Master. Jesus brought us into communion with the Trinity through Baptism, and He continues to sustain and nourish our union with Him through the other Sacraments. But He does this not just for our individual sake: we’re not united to Jesus just for ourselves alone. Precisely because we’ve been called to share in the life and love of the Trinity, we’re also called to share in Jesus’ mission to bring that same communion to the world. Love, precisely because it always looks to the other, also always seeks to expand itself toward another. That’s why Mother Teresa wasn’t satisfied to just embrace one dying person, or why missionaries don’t stop after just one conversion. Jesus thirsts for everyone to share in His Trinitarian life, and so must we. If we’ve truly experienced the love and mercy that Jesus has come to bring, then we need to share it with others; like Him, we need to desire that others may come to know and experience His love for them. This is our mission as disciples. But we also need to love one another; we need to seek communion with each other as well. As a children’s book once put it, “If Jesus loves me and He loves you, too, then I ought to love you, too”. We need to reach out to each other to build communion, and not just as a closed-off group of mutual affection and appreciation, but as a community that is constantly reaching out to others to invite them in also. This is particularly the mission of the family and of the Parish, because it’s through us that the world will come to know and experience the love of Jesus. By the way that we greet others; by the way that we welcome them and include them, others will come to know that God loves them and wants them in communion with Him. But if we ignore them, give them the cold shoulder or push them away, then that becomes the experience of God we give them. This is why Jesus said, By this everyone will know that you are my disciples, if you have love for one another (Jn 13:35). When we ponder on this reality of being called to communion with God and with each other, we can begin to get a glimpse into what it means for the Trinity to be a communion of love. As we celebrate today this great mystery of the God who reveals Himself as a communion of love, may we open our hearts to His invitation, allowing Him to draw us into this communion with Him, so that in turn, we might work to bring others in as well. Amen. Ps 19 R. Their voice goes out through all the earth. Ps 34 R. The Lord has set me free from all my fears. Nothing could be further from the truth! In the Acts of the Apostles, St. Luke clearly sates that the disciples of Jesus were of one heart and soul (4:32). Their union with God translated visibly into a union with each other; this was a hallmark of the early Christian community! Sts. 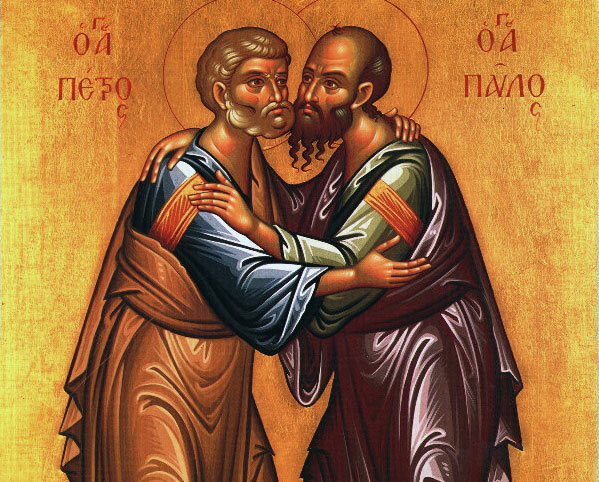 Peter and Paul were no different: both dedicated their lives to preaching Christ and bringing people to repentance and union with God; both laid down their lives for Jesus in the Roman persecutions of Nero (64-68 AD). Both believed with one heart, preached with one heart and died with one heart. It’s for these and other reasons that the Church has held, nearly from the beginning (ca. 258 AD), a solemn feast to celebrate these two Apostles together. When Jesus first called Peter to become a disciple, it was from the shore, as Peter and his brother Andrew were fishing. Jesus said to them, follow me, and they did (Mt 4:18-20). When Jesus was walking on water, he called out to Peter and said, come (Mt 14:29). Peter himself later even said, Look, we have left everything and followed you (Mt 19:27). But when Jesus was arrested, and the other Apostles left Jesus, Peter, who had claimed he would follow Jesus unto death (Mt 26:33, 35), followed Him only at a distance (Mt 26:58) and even went on to deny Jesus three times (Mt 26:69-74). After the Resurrection, Jesus again appeared to Peter from the shore. Three times He asked, Peter do you love me? (Jn 21:15-19). Having said yes, Jesus, once again called him, Follow me (Jn 21:19). And this time Peter did, even unto death. Having experienced the depths of Jesus’ love — Jesus never gave up on Peter, never rejected him, never condemned him —, Peter finally gave himself over to God’s love: Lord, you know everything; you know that I love you (Jn 21:17). And because of this abandonment to God’s love, the Holy Spirit was able to transform Peter from a man of fear and denial into one of courage and fidelity. We see this very clearly on that first Pentecost, as Peter preached the first homily and baptised 3000 people. For his part, St. Paul started out as what he thought was a perfect Jew (Phil 3:4b-6). He was zealous for God and the Law, and strove with all his power to perfectly obey the will of God. That’s why he was able to approve of the stoning of Stephen (Acts 8:1), and dedicate himself to stopping the Christians (Acts 8: 1, 3; 9:1-2). But then Paul heard God’s voice: I am Jesus, whom you are persecuting (Acts 9:5). The man who once arrested Christians and would have happily killed them for God, was now awakened to God’s true identity. Paul’s zeal for the Law had blinded him to God’s identity, but God, in His loving mercy, reached out to him and turn his zeal for the Law into a zealous love for God and people. Jesus, in His mercy, called Paul to repent and be an instrument of salvation (Acts 9:15). St. Paul spent the rest of his life helping others to love and follow Jesus. My dear brothers and sisters, our weaknesses and sins only become obstacles to following Jesus when we keep them away from Him. When we accept Jesus’ love and mercy, and give ourselves over to Him, allowing His love to transform us, our sins become shadows of the past and our weaknesses, sources of strength. Jesus was able to turn an impetuous, quick-tempered apostate and a prideful accomplice to murder into two of the greatest Saints of the Church. He turned their stubbornness and zeal into instruments of salvation for the world, and their bodies into sacrificial offerings to God. If He can do that with Peter and Paul, what will He accomplish with us if we follow Him? As we remember these two giants of faith — upon whose faith we stand today as Roman Catholics —, may we turn to them for their example and invoke their intercessions, as we strive to give our hearts over to Jesus, so that with them, we too, might be of one heart and soul with Christ and with all believers. Amen. Ps 147 R/. Praise the Lord, Jerusalem. On Holy Thursday we celebrated the institution of the Mass and of the Priesthood. Today, we celebrate a special feast in honour of the Holy Eucharist itself, the Solemnity of the Most Holy Body and Blood of Christ. The Church has celebrated this feast for almost 800 years now, as a means to remember and celebrate the tremendous gift of the Eucharist. And so this feast, then, is one of great joy and gratitude, because the gift that we celebrate today — the Eucharist — isn’t a mere ‘friendly meal’ or some symbolic sharing of bread and wine; the gift we celebrate with this Solemnity is the gift of Jesus Himself, given to us on the Cross in flesh and blood. 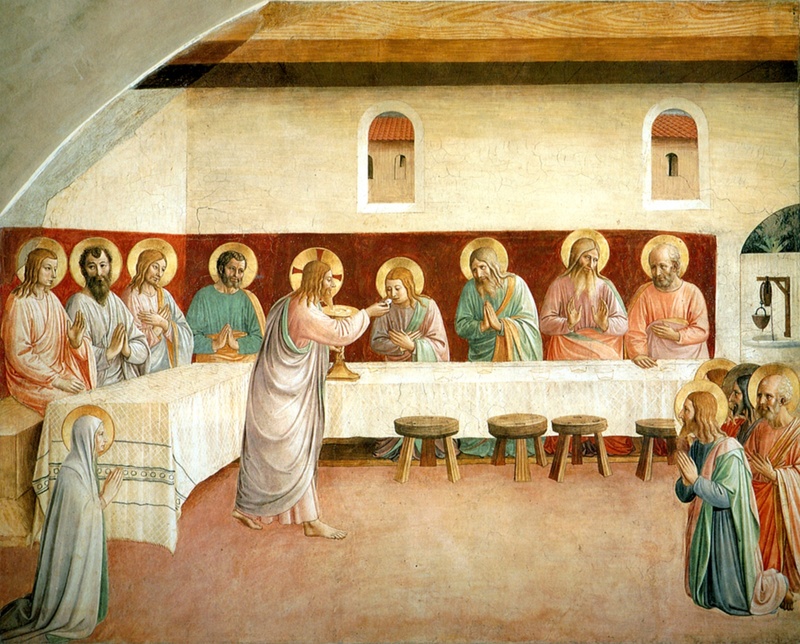 As we hear in during the Eucharistic Prayer at each Mass, Jesus, at the Last Supper, said, Take this … for this is my Body… the Blood of the new and eternal covenant… (Words of Institution). 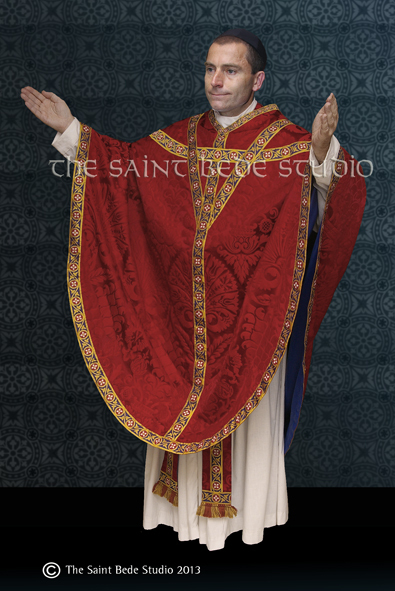 Now every Sacrament in the Church happens through a combination of word and an action — in Baptism, the minister says I baptise you in the name of the Father and of the Son and of the Holy Spirit, as he pours water on the child; in Confession, after sins have been confessed, the Priest lays his hands over the penitent and says the formula of absolution; in Marriage, the couple give themselves to each other through their vows at church, and then fulfil that gift bodily in the marital act. The words of gift that Jesus makes of Himself at the Last Supper are fulfilled in body on the Cross, where He literally gives us His flesh and blood for our salvation. When we put these two parts together — the words of the Last Supper and the gift on the Cross —, we have the Sacrament of the Eucharist. This is the Mass! It’s the gift of Christ made present for us today, so that we might receive from Him that very gift of His flesh and blood, that we might be fed and strengthened by His sacred Body and Blood. And just as when a husband and wife come together to give of themselves to each other in body, so too, in the Eucharist, Christ’s love for us is expressed and our love for Him is strengthened. In receiving the Holy Eucharist we’re united to Jesus in the most intimate communion possible in this life. So much so that, through it, we receive His divine life, for now His Body and Blood live in us, and work in us to transform us ever more into His image and likeness. Become what you eat!, St. Augustine used to say. This is why the Church speaks of the Eucharist as the source and summit of the Christian life. Source, because it’s through the Body and Blood of Christ given to us on the Cross that we’ve been saved; it’s through the Body and Blood of Christ given to us in Communion that we’re made into more perfect disciples and are strengthened to live the Christian life. Summit, because its through the Body and Blood of Christ celebrated at Mass that we offer to the Father the greatest gift and thanksgiving possible, and through that, experience our most sublime heritage as the people of God; and because through the Body and Blood of Christ, God makes Himself near to us, not just in Spirit, but also in Body. These are challenging truths that we celebrate today, and they always have been. As we heard in John’s Gospel, many disciples found it hard to believe in what Jesus said: How can this man give us his flesh to eat?, they asked (Jn 6:52); many even abandoned Jesus as He continued to explain how His Body and Blood are true food and drink (Jn 6:66). The Church continues to profess this same truth today: the bread and wine that we offer at Mass truly does become, through the power of the Holy Spirit, the Flesh and Blood of Jesus Christ. And so the Communion that we receive, then, is none other than the Body and Blood of Christ: the same Body which was given up for us on the Cross; the same Blood which was poured out for us on the Cross. This is the food with which our Lord feeds us on our journey of faith; this is the extent to which He loves us; this is the gift that we celebrate today and receive at each Mass. There can be nothing greater in this life than to witness this miracle of God’s love and to receive this gift for our life and our salvation. This is why the Eucharist is sacred; this is why we celebrate with joy! The Eucharist is our glory as children of God, and a foretaste of the eternal communion promised us through the covenant of Christ’s blood. May we continue to grow in our love and understanding of this great mystery, so as to better appreciate and adore this wondrous Sacrament. Amen. The Solemnity of the Most Holy Body and Blood of Christ (also known as Corpus Christi) is celebrated on the Sunday after Holy Trinity. It’s a special feast in honour of the Holy Eucharist that highlights the importance of the Eucharist in the life of the Church. ‘But isn’t Holy Thursday the feast of the Eucharist’, you might ask? It is, but it’s also the feast of the Priesthood, of the great commandment to serve one another, and of the Agony in the Garden. And since Holy Thursday falls right between Lent and Passion Friday, it isn’t the most favourable time for a joyful festival. These were some of the reasons that St. Juliana of Liège proposed 800 years ago in her repeated appeals for such a feast. In 1264, Pope Urban IV agreed and established Corpus Christi. At the request of the Pope, Saint Thomas Aquinas wrote many of the prayers and hymns used for this feast, most notably O Salutaris and Pange Ligua (Tantum Ergo). This Solemnity has the purpose of inviting the whole Church to celebrate the great gift and joy that is the Eucharist; of renewing and strengthening our belief in the real and abiding presence of Christ in the Eucharist; and of reminding us of the tremendous love God has for us in bringing us into Covenant and Communion with Him through the Body and Blood of Christ given on the Cross. Each Mass celebrates the Eucharistic sacrifice of Jesus on the Cross, and re-presents, commemorates and perpetuates that one single offering, and allows us to participate in it here and now, in our own day, by receiving His Body and Blood, as if we had been there when He was crucified. For those who have been reconciled to God, receiving the Eucharist unites us to Christ in His sacrifice, gives us a share in His divine life, feeds us to live the life of faith, and sanctifies us so that we might become more and more like Him, whom we receive, and to whom we have been united. May our worship of this Sacrament of Christ’s Body and Blood helps us to experience the salvation He won for us and the peace of the Kingdom, where He lives and reigns with the Father in the unity of the Holy Spirit, one God, for ever and ever. Amen. Canticle: Dan 3:52-56 R/. Glory and praise for ever! 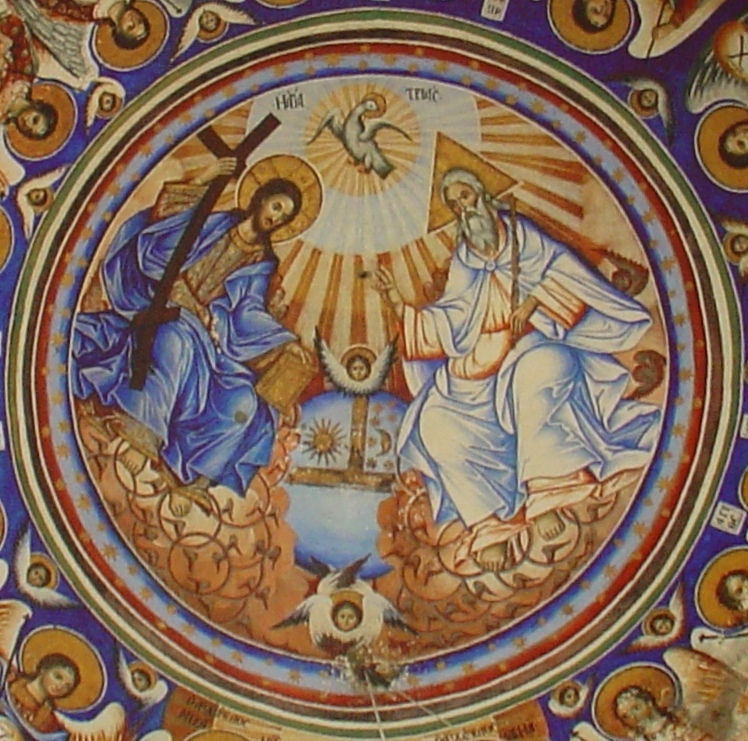 Icon of the Holy Trinity at Vatopedion Monastery, Mount Athos, Greece. The great St. Augustine spent more than 30 years writing his book De Trinitate [On the Trinity], trying to find a clear way to explain the mystery of the Trinity. The story goes that, one day, while walking by the sea, pondering the mystery of the Trinity, he saw a young boy running back and forth from the water to the shore. The boy was using a seashell to carry water from the ocean to a small hole in the sand. The Bishop approached him and asked, “My boy, what are doing?” “I am trying to bring the whole sea into this hole,” the boy replied with a sweet smile. “But that is impossible, my dear child,” said Augustine. The boy stopped, and looked up at Augustine, saying, “It’s no more impossible than trying to understand the mystery of the Trinity.” Then he vanished. If Augustine, one of the greatest theologians in the history of the Church, had a hard time understanding the Trinity and putting it into words, then it’s no surprise that we do too, and that’s okay! That’s why today, as we celebrate this great mystery, we marvel at God’s greatness. And we rejoice, too, because in His great love for us, God allows us to participate in His life, in His very Being, in the Trinity! You see, we began Lent by hearing the voice of God calling us out into the desert. Then we followed Jesus through His Passion, Death, Resurrection and Ascension. Then last week we closed Easter by rejoicing in the gift of the Holy Spirit. Today, we reflect on that time by rejoicing in God, who’s revealed Himself to us as Father, Son and Spirit. But we rejoice today, not merely in knowledge, but in the experience God. Because God has revealed Himself to us, so that we might be able to participate in His divine life! The Trinity can be explained briefly in this way: God the Father is, by His very essence, love, and allowing His love to flow from Himself, He begets the Son, who receives this love. But because the Son is also God and shares in the same nature as the Father, He, in turn, overflows with love to the Father, returning love for love. And it’s in this dynamic of mutual love that the Spirit proceeds from them both. But the really cool part about all of this, is that, through the Incarnation — by joining our human nature to His divine nature — Jesus has brought us into this dynamic communion of love! In Baptism we were united to God — Father, Son and Spirit —, and received a share in His divine life. And that’s what it means to be saved: to have God’s very life within us! That’s why we belong to Him, why He is our God and we, His people. Through Baptism, we enter into the Trinity. And this is God’s desire for everyone; God wants everyone to be saved! But as we say during the Rite of Baptism, this divine life needs to be “kept safe from the poison of sin, to grow always stronger in [our] heart” (no. 177). Just because we’ve been Baptised, it doesn’t mean that we’ve got a free ticket to Heaven. If we don’t live, here and now, according to this gift we’ve received, then we will lose it; the divine life within us can be killed. That’s why Jesus gave us the Sacraments: in particular, Confession to heal and forgive us, and the Eucharist to make us stronger. And every time we receive any of the Sacraments — but especially Confession and the Eucharist —, we’re sanctified and increasingly conformed to Christ, and enter more deeply into the life and mystery of the Most Holy Trinity. This — and only this! — is salvation. This is the mystery we celebrate today, indeed that we celebrate at every Mass, as we marvel at the mystery of the one God in three Persons who shares His love and His life with us. By opening our hearts to the Spirit, and living more and more according to the law of Christ, may we come to share fully in the Father’s life. Amen. On the Sunday after Pentecost we celebrate the most profound mystery of our Faith: the Holy Trinity. Now by ‘mystery’, I don’t mean some sort of puzzle or thing to be solved. ‘Mystery’ in terms of the Faith refers to a belief based on Divine Revelation, especially one that’s beyond our full human understanding. So to say the Trinity is the most profound mystery, is to say it’s the most central aspect our faith as Christians: it’s “the mystery of God in himself. …the source of all the other mysteries of faith” (Catechism, no. 234). It’s also the most complicated mystery of our Faith, one that we cannot know by reason alone. We know about the Holy Trinity – Father, Son and Spirit – only because Jesus Himself told us about it. He spoke frequently of His Father, and later of the Spirit of truth who would come to teach us (Jn 14:16-17; 16:13). Then there’s the great Commission: Baptise in the name of the Father and of the Son and of the Holy Spirit (Mt 28:19). We find in these, and many other passages, the three Persons of the Trinity: Jesus the Son, the Father and the Holy Spirit. 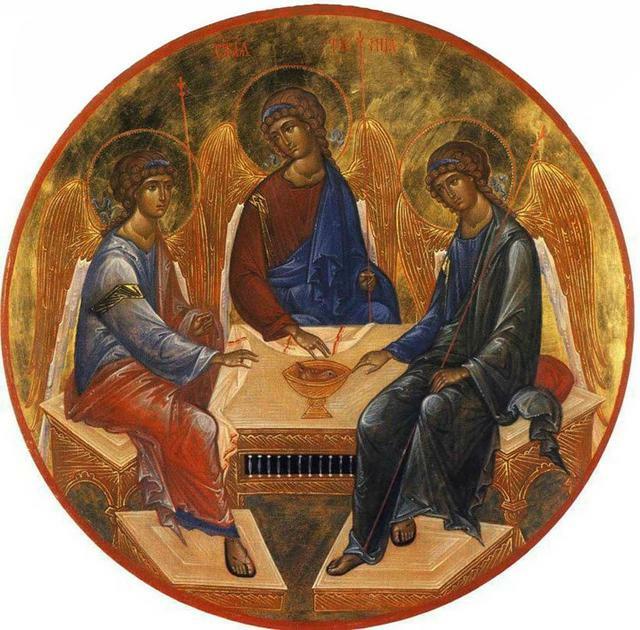 Icon of the Holy Trinity, by Andrei Rublev, 15th century. But these three Persons are not three separate gods; they’re one God. And they’re not three ‘faces’ or ‘roles’ of the one God, as if God took on different forms to do different jobs. The Trinity is one God because the three ‘Persons’ have the same ‘nature’; they’re consubstantial, as we say in the Nicene Creed. That’s why we call it the Trinity, the ‘tri-unity’, the ‘three-in-one’. The Father is the source and origin of all things. We call Him ‘Father’ not because He is male, but because everything finds its beginning in Him, and because He is loving to all His children (Catechism, no. 239). As St. John says, God is love (1 Jn 4:8), and love necessarily seeks to flow out of itself toward the object of affection. The Son is the first object of affection: He is the beloved who is begotten by the Father’s love. It’s this begetting that makes the Father ‘Father’, and the Son ‘Son’. And since God is love in His very nature, the Father has always flowed out to the Son, and the Son has always existed with the Father as the receiver of this love. It’s for this reason that St. John writes: In the beginning was the Word, and the Word was with God, and the Word was God (Jn 1:1). They are distinct Persons because they relate to one another as Father and Son, as the One who loves and the One who is loved and who loves in return. The Spirit, in this analogy, is the Love who binds them; the Love which flows from Father to Son, and from Son to Father. 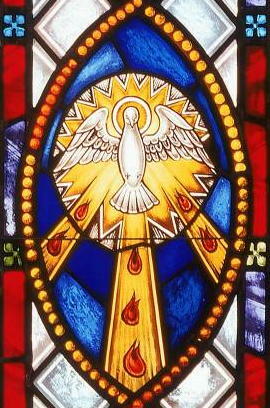 And since this exchange of love between the Father and the Son has existed from eternity, so also has the Holy Spirit. While knowledge of the three Divine Persons was revealed to us over time, their existence is from eternity. As the early Church Fathers would say: There was no time when the Father was without the Son or the Spirit. Now you begin to see why it’s the most complicated mystery of our faith. As we rejoice in this great mystery of God’s divine love, may we contemplate it so as to grow in our love for the Father, Son and Spirit. For more reading, see Catechism, nos. 232-248.